How commercial-scale bone broth came to the North Bay. Cesar Vernier’s surgical steel pot would reach his waist if it sat on the ground. Because he’s hoisted it onto a stovetop, the co-founder of The Bone Broth Company uses a small step-ladder to add ingredients, which, at this point in the lengthy process, are simply water and 80 pounds of chicken bone from organic, pastureraised birds. “It’s quite the endeavor, the way I’m doing it,” he says on a recent Saturday morning, dropping in a chunk of frozen bones all stuck together, the size of a Costco sheet cake. We’re in the shared commercial kitchen in northwest Santa Rosa that he rents with co-founder and business partner Mudita Kristy Hinton, a nutrition consultant and chef who manages the company’s marketing and bookkeeping. After the first elemental step of adding bones to water, Vernier lets the concoction simmer for between 2.5 and 3.5 days (beef and bison take longer than chicken), returning at least three times a day to check on it. Toward the end, he adds his veggies, herbs, and spices before straining the mixture into another giant pot. These days, Vernier makes between 300 and 500 quarts a week, depending on the season. That’s quite a jump from the 20 quarts a week he was selling at the Sebastopol Farmers’ Market when he and Hinton began the company in 2013. The company’s timeline roughly matches the rise of bone broth’s popularity in the U.S. though it’s long been a nourishing tradition in Asian and other food cultures. In America, it’s been called everything from the cure-all to all that ails you to a trendy, if delicious, placebo. Or something in between, like a good source of amino acids to help fortify bones and joints, depending on who you ask. On a local scale, Vernier and Hinton helped to set the trend. In 2012, Vernier had recently relocated to Sonoma County from Miami, where he’d lived since immigrating from El Salvador at age 14. He’d been cooking as a private chef and was feeling burnt out, wondering what to do next. A good friend’s advice—to look for waste in the food system—had stayed with him. One night, he and Hinton decided to make paella for some friends. He prepared it the way he always had, with a broth base. “When I saw how he took the extra care in making the broth, this rich stock that made the paella so awesome, I thought, ‘People will buy that,’” Hinton says over the phone, several days after my meeting with Vernier. “When she said that, it reminded me of when my friend told me to find food waste; the light bulb just went on,” Vernier recalls. 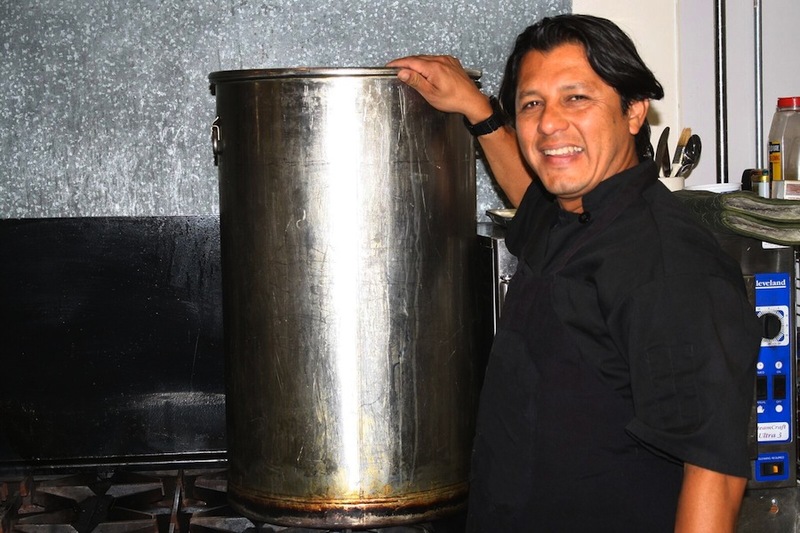 The recipe Vernier uses isn’t a family recipe, but bone broth has deep roots in El Salvador. The concept of using an entire animal, and reducing waste, came from his childhood as well. He grew up hunting small game—rabbits and birds—and his grandmother taught him the delicate art of skinning, showing him which organs to remove and which ones to keep. And he was impressed by the broth’s many medicinal uses. “In El Salvador they would kill an animal, immediately crush all the bones and make a concentrated soup, and then give it to whoever was dying. And a few times I remember the adults talking like, ‘Oh yeah, he came back to life, he was totally resuscitated from the dead,” he says. At the same time, Vernier is careful not to make any claims or guarantees now, adding that he doesn’t know the exact health benefits of the broth. But people do order it when they’re sick. For now, Hinton says the company is devoted to the development of its bone broth rather than rapid scaling. “Our dedication is to growing slow and maintaining quality,” she says. Find The Bone Broth Company at the Sebastopol Farmers’ Market, Sebastopol Plaza on Weeks Way, Sundays, 10am to 1:30pm. Also availableat Andy’s Market, Community Market, Sonoma County Meat Co., and Shelton’s Market.